Keeping your dog looking its best requires regular grooming including brushing, clipping, and bathing. Using a good quality dog conditioner available will also help by making your dog’s coat shiny and soft. Conditioners can also make your dog smell nicer and soothe and moisturize itchy, dry skin while detangling matted fur. Purchasing a dog conditioner may sound like an easy task but weeding through all of the products available to find one that works well and suits your dog’s needs can be frustrating. In this article, we will talk address most common questions related to dog conditioners and also discuss the best dog conditioners in the market today. The best brands were compiled and reviewed to help you make an informed purchase decision. Check them out and see which one is the best dog conditioner for you and your pet. What is a Dog Conditioner? Dog conditioners are special formulations that are used for dogs. Using human products on dogs can lead to skin allergies and irritations, so there is a need for special dog products. These formulations work on the fur of the dog in various ways. It can smoothen the fur and/or make it shine. It can also add volume to the dog’s fur so that the coat looks more wholesome. Some conditioners even relieve itchiness and soothe the skin. Conditioners also help to remove tangles and mats in the dog’s fur so that you can comb through easily. Unlike in the choice of shampoo, when choosing a conditioner, your dog’s skin type does not matter much since conditioners do not affect the oil balance of the skin. You generally have two choose between two types of conditioners- spray or bottles conditioner. Spray conditioners– These conditioners are used immediately after your dog has a bath, while the coat is still damp. You do not have to wash out these conditioners. Just spray it onto the fur and comb through to remove tangles and knots. These conditioners often use the help of alcohol, to make a spray formulation, which may cause allergies on your dog’s skin. Bottled conditioners– These conditioners are like standard human conditioners. Like human conditioners, they need to be applied after shampooing and should be rinsed out. It moisturizes the fur and removes tangles. Since these are leave-in conditioners, you need to ensure that these also do not have compounds that react with the dog’s fur and skin. This approach simplifies the choice between conditioners in the market since there are numerous brands in the market. You can also match your conditioner to the shampoo that you use, the same approach that we use for human shampoos and conditioners. Sometimes shampoos are mixed with conditioners, forming a conditioning shampoo, which does the work of two products and saves you money. Knowing what makes a good dog conditioner and understanding how one is supposed to work can help you shop for the best dog conditioner. Still, with so many options available, it’s hard to know where to begin your search. Here, some of the top dog conditioners on the market are analyzed based on their descriptions and actual user reviews to help you in your search. Before anything, it’s important to note that you should avoid using human conditioner on your dog. Human skin and hair have a different pH level than that of dog’s so dog grooming products like shampoo and conditioner are specifically made to match the pH level of your pup. When you use something else like a human conditioner you risk damaging your dog’s coat and skin. Human conditioners are too harsh and may use certain ingredients that can cause allergic reactions and irritation when used on dogs. It will also throw off your dog’s natural pH level and affect their natural oils which can make their coat look dull and feel coarse and brittle. 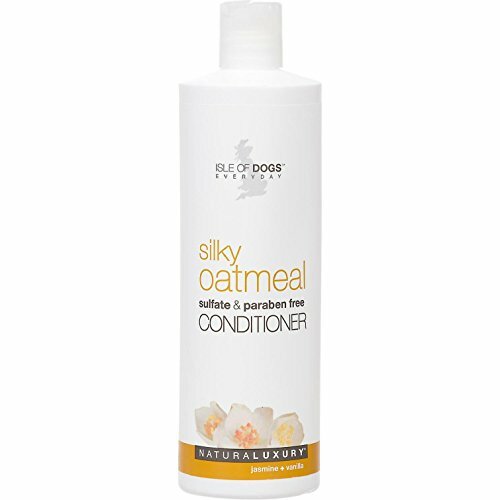 Stick to conditioners made specifically for dogs; your furry friend will thank you. When shopping for the best dog conditioner, you have to know what separates a good product from a bad product. You also have to know what to keep in mind when comparing different conditioners. By doing this, you won’t be fooled by buzzwords, pretty labels, or boastful slogans. As you compare products, think about your dog and if they have any skin conditions that need to be addressed. For example, if your dog has chronic dry skin you’ll want a conditioner that can help soothe their skin and moisturize it. You should also take your dog’s health into consideration. Some dogs have diagnosed allergies while there are also breeds that are known to have sensitive skin and are prone to allergic reactions. If this is your case, you should look for gentle conditioners that don’t use harsh, synthetic ingredients. Next, you should think about your own preferences. If you are the type of pet parent who wants to use all-natural products on your pup, look for conditioners that are free of chemical ingredients. You may also want to pick a conditioner that has a scent you like. If you’re shopping online, it’ll be hard to determine what the actual conditioner will smell like but the description will usually tell you what the product is scented with. For example, you can find some conditioners that use lavender for a natural scent while others might use herbal scents. Knowing what to look for in the best dog conditioner is one thing but you should also try to avoid certain things as well. First, check the listed ingredients and steer clear of artificial dyes, artificial fragrances, and parabens. These are all known irritants that can easily cause allergic reactions in dogs and dry out their skin and coat. You might have to do some research or read reviews extensively to really find out about a product’s ingredients. In the US, dog grooming products aren’t regulated by any government agency so they aren’t required to list all of their ingredients. In fact, some brands don’t list any of their ingredients on their package. In these instances, looking at the conditioner itself can help. Brightly colored conditioners most likely have artificial dyes in them while overly scented conditioners are more likely to have artificial fragrances in them. Similarly, thick conditioners could have chemical thickening agents in them. All of this can cause problems for your dog’s skin. By keeping these things in mind as well as your own dog’s needs and your personal preferences, you can compare different products and find something that meets all the criteria for the best dog conditioner. If you’re unsure of your dog’s needs or if they have allergies, be sure to consult your vet before trying a new product. They can help you determine what kind of grooming products are the best for your dog’s coat and skin and can even recommend certain brands that they trust. Yes, using conditioner on your dog adds extra steps to your bath time routine, but it’s worth your extra time and effort to do so. The benefits of using conditioner on your dog are enough to convince you to at least try conditioning your dog once during their next bath. A good shampoo will get your dog nice and clean but can leave their coat a little lackluster while possibly drying out their skin. By using a conditioner you can help moisturize their skin and coat to make up for the oils that the shampoo rinsed away. It prevents their fur from drying out by sealing the hair cuticles so they don’t lose any more moisture while also adding nutrients to their skin and fur to replenish moisture naturally. This product can also detangle matted hair making it easier to brush after their bath. Overall, a conditioner will leave your dog’s fur shiny, smooth, and soft when used properly. To understand how dog conditioner works, look to its ingredients. Conditioners contain specific ingredients that moisturize your dog’s coat while other ingredients work to soften and detangle the hair. The conditioner and water are absorbed by your dog’s skin and fur where they can work properly. Whether the conditioning agents are natural or synthetic, once they are absorbed into the hair cuticles and your dog’s skin they can repair brittle fur to make it softer and shiny and help trigger the release of natural oils in the skin to combat dryness or flaking. Normal conditioners require you to lather up your pup and then rinse them off in the same way you would with a shampoo. However, there are also leave-in conditioners that make conditioning your dog a lot easier. These are products that you apply to your dog’s fur and skin without having to rinse them off. Some are creams that you rub in and comb through the coat while others are a spray that you use while your dog is still damp from their bath then brush through their fur to detangle any mattes. Sprays usually use alcohol to help detangle your dog’s coat so if your dog is sensitive and their skin tends to dry out easily, avoid products with alcohol. Neither requires any rinsing so it speeds up bath time without forgoing the use of a conditioner. If your dog has a long coat, a conditioner can prove to be invaluable. Long coats tend to tangle and matte so using a conditioner can make brushing them a lot easier. Conditioner will also make long coats healthier. With so much fur, nutrients may not be evenly distributed to properly nourish long coats. A good conditioner will add more nutrients to the coat so every inch of it is soft, shiny, and manageable. This is a shampoo and conditioner that allows you to clean your pup while also conditioning their skin and coat. It’s one of the best-selling dog grooming products that is quite popular with pet parents as well as groomers. There are different variations of the product but the oatmeal-based formula is highly rated especially for dogs with dry, itchy skin. The Paws and Pals product features a tear-less formula with natural ingredients including Argan oil, oatmeal, shea butter, jojoba oil, and coconut oil. All of these ingredients not only nourish your dog’s skin and coat but will also help cleanse your dog and soothe irritation. Since the product is natural, there are no harsh ingredients so it’s gentle on most dogs including those prone to allergies or irritation. 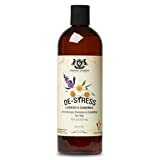 Another combination of shampoo and conditioner, this product is popular with people looking for a conditioner that smells great without the use of artificial fragrances. It uses lavender and chamomile to add natural aromas that not only make your dog smell great but they also help your dog relax which can help make bath time a lot easier on you and your pup. The formula also uses oats and aloe vera extract to soothe irritation that might be present while also leaving their coat shiny and smooth. It’s free of parabens and dyes, too, making it great for sensitive dogs and those prone to allergies. Made by one of the best natural pet supply companies on the market, this conditioner is great for dog parents who are looking to avoid chemical ingredients. The formula not only conditions your dog’s skin and coat but will also detangle matted fur while leaving behind a vanilla, almond scent to keep your dog smelling fresh. This conditioner can even be purchased in a scent-free variation that is great for sensitive dogs that have an aversion to any fragrance. Furthermore, the oatmeal and aloe in the conditioner help soothe irritated skin making this conditioner great for dogs with skin conditions. It’s also quite affordable considering that it’s a certified-organic product. You can buy it alone or get a multi-pack to stock up for the future. The shampoo is manufactured by Furminator. This is not a general purpose conditioner. It is formulated specially to reduce cases of excessive shedding in dogs. This needs to be applied like a normal human conditioner, and rinsed off. Its unique properties are due to a number of natural ingredients into the mixture used for conditioning. The manufacturer promises that there are no dyes or parabens in the conditioner. These are chemicals that often react with the dog’s skin and may cause a number of allergies. The product is made in te United States of America. The oatmeal conditioner from Isle of Dogs is quite popular due to its natural deodorizers. If your dog has a tendency to smell more than other dogs (as some breeds tend to do), this conditioner can help control the odor while also conditioning their skin and coat. This works even better when used with the corresponding shampoo. Whether your dog has a long coat or is short-haired with a thick undercoat, this conditioner can work to make their fur more manageable, soft, and shiny. It can penetrate deep down and nourish each hair cuticle to make it healthier from the inside out. 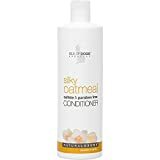 This is spray-on leave-in conditioner that is quite popular with busy pet parents who want to condition their dog without prolonging bath time. The spray works by detangling mattes especially those that tend to form in dogs with long coats. Silicon in the formula also works to repel dust and dirt so you can use it between baths to keep your dog looking their best. It’s simple to use after bath time or in between baths. When using this during your dog’s bath, spray it on their damp fur and brush it through their coat. Here, a little goes a long way so you won’t have to use too much of the product to get the desired results. To detangle thick mattes between baths, spray the product directly onto the tangled fur enough to saturate the area and comb out the tangles. A tip to help severe tangles is to mix one ounce of the spray with four ounces of warm water and, after shampooing, pour the mixture over your pup and rub it into their coat and skin (no rinsing required). When you’re looking to make your dog’s dull coat shiny again, this spray leave-in conditioner is a great option especially if you’re on a budget. This inexpensive brand comes in different sizes to suit all lifestyles, too. The formula is packed with vitamins and natural tea tree oil to nourish your dog’s skin and coat while also protecting your dog’s fur from becoming brittle. You can use this after a bath while your dog is still damp by spraying it on and combing it through your dog’s coat but it can also be used between baths. If your dog is looking a little lackluster between baths, spray Miracle Coat on them and com it through to restore some shine to their dull coat. 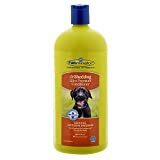 This is great for dogs that are too sensitive to be bathed frequently. It can also be used to make longer coats more manageable between baths. Another interesting feature is the bottle’s quiet spray application. Some dogs get nervous when they hear the noise from a spray bottle which can make this task daunting. This bottle, however, doesn’t make any noise when you spray it so your dog won’t react while you use it. If you don’t like the spray leave-in conditioners but are looking for a conditioner you don’t have to rinse off your pup, this is a great option. 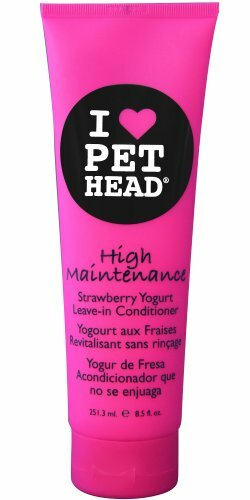 Boasting a delicious strawberry yogurt aroma, the formula is made to match your dog’s pH level while still being free of parabens, sulfates, and similar harsh ingredients. Vitamin B5, lavender oil, and flower oil give your dog’s coat a beautiful shine and also nourish their skin to make it healthy and hydrated making it great for dry, itchy pups. While there are no declared harsh ingredients in the formula this isn’t an all-natural product so if you’re turned off by any synthetic ingredients you may want to look elsewhere. Another thing to note is that, unlike other leave-in conditioners, this one should only be used after a bath. This is because you’re supposed to blow dry your pup after applying this conditioner to them and it might be inconvenient to do that between baths. Some spray conditioners have alcohol which is harsh for your dog’s skin. So avoid these conditioners. Check the contents of your dog’s shampoo to see if there are any harsh ingredients that do not suit your dog. Ensure that your conditioner is tearless. While conditioning, keep the conditioner away from the dog’s ears, even when the product is tearless. Avoid heavily scented products because the chemicals that make the scent cause a number of allergies and the smell may be suffocating to dogs since their sense of smell is much greater than human’s. There are plenty of different dog conditioners on the market and all offer their own benefits and have their own disadvantages. If you don’t know where to start, these reviewed conditioners can serve as a jumping-off point for your search. Hopefully, one of these will be the best dog conditioner for you and your pet but if none of them hit the mark, you now have the information to do some comparison shopping of your own and find something that fits your needs and preferences. Remember, check with your vet if you’re worried about allergies or skin conditions before trying a new product. Do you use a dog conditioner for your dog? What brand do you use and what is your feedback? Do share by commenting below! Can You Use Human Shampoo / Soap on Your Dog?